RAM’s newest innovation may not be the most high-tech, but it will offer an extra tool for those who use their trucks for work and transporting. 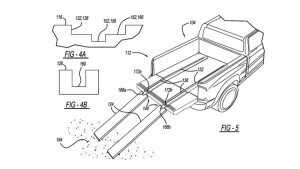 RAM was recently granted a patent for built-in ramps stored within the truck bed. With a closer look at these renderings, the ramps appear to be able to be set at two different widths, making loading different vehicles. Of course, a granted patent doesn’t guarantee that this “RAM Ramp,” coined by AutoBlog’s Seyth Miersma, will come to production. However, a convenience feature such as this will ease the efforts. These ramps would certainly beat keeping some planks lying around the garage for loading up that ATV or motorcycle. Take a look at the slideshow below for a closer look at the patent drawings. At Atlanta Commercial Trucks powered by Landmark Dodge Chrysler Jeep Ram of Atlanta, we help drive your business with work-ready Ram pickups, Ram chassis cabs, vans and more. Landmark is the only Atlanta area Chrysler Dodge Jeep Ram dealer with a sales division dedicated to our business customers. We are the fastest growing Ram commercial dealer in Georgia and the Southeast! We have one of the largest Ram work truck inventories in the state and carry 2500 and 3500 utility trucks as well as 4500 and 5500 chassis cabs. Call us today at 678-251-2283, contact us online or come by today at 6850 Mount Zion Blvd. in Morrow, GA.